Make your presentation relevant. This is the presentation tip that just can’t be ignored. Whether it’s a trade show presentation, a corporate presentation or a PowerPoint presentation. Because you have to make your presentation relevant to your audience. That’s why it’s the main presentation skills advice. If there’s anything worse than listening to a tedious and unimaginative presentation then it has to be actually giving that tedious presentation. Because it’s not that you can sense the boredom of the audience. You can actually see it in their entire body language. Restless limbs. Turning heads and eyes looking elsewhere. And that’s before the yawns start. Because PowerPoint makes audiences sleep. Work out what your audience expects. Segment your audience and then, address each segment. Understand the theme of the main event. Review other presentations at your event. Then, provide the right level of detail. Use examples or case studies for illustration. Then, tailor your examples for your audience. Mention names familiar to your audience. Cite examples known to your audience. Refer to topical issues involving the audience. So, for an approach to your presenting that can make your presentations relevant, then plan ahead. That’s not exactly rocket science. So, knowing your audience is a good place to start. The next step is to anticipate their needs. Finally, you want to meet their needs, in an engaging and captivating way. Just remember that those needs are not complex. The MH17 team presentation proved highly relevant with its very clinical execution. Your audience wants to learn, know, understand or believe something new. And it’s your job to make it happen. When you keep your presentation relevant to your audience you are well on the way to presenting success. 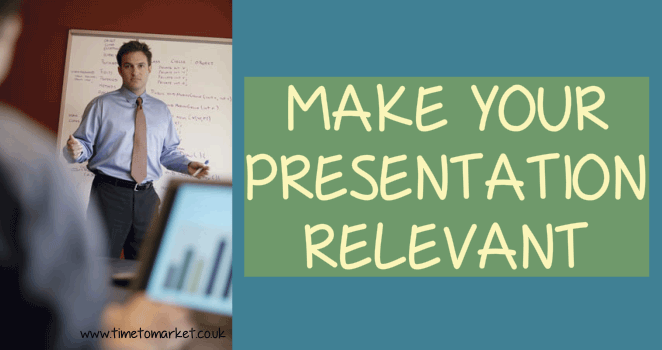 For more presentation skills tips you can always join a PresentPerfectTM training course. Because with more than 40 training centres to choose from you are never that far from your next training course. Please don’t hesitate to get in contact when you want to boost your own presentation skills.